Visit Tres Rebeccas shop in San Antonio, across from El Mirador, on S. St. Mary's. A day of the dead exhibit of selected paper cuts by Kathleen, is on view now, with an opening on First Friday, Nov. 6th. Here is a preview, with my latest victim, Mike Casey, on bicycle, as the Grand Marshal for the King William Fair Parade. 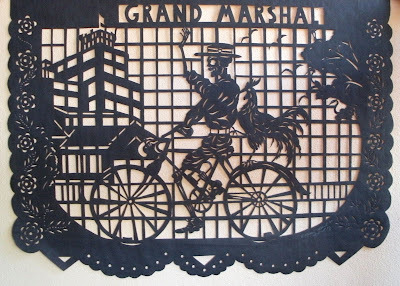 He is riding past the Pioneer Flower Mill, waving to his admirers, wearing his usual straw hat. One of his many chickens accompanies him. The paper cut is 4/5'. Viva Mike!